Home»Just Hungry reference handbooks»The Japanese Food and Cooking Lexicon»The Mystery of Japanese "Sauce"
Miso, soy sauce, bonito flakes...these are the kinds of ingredients you'd expect to be used in Japanese recipes. But there's another ingredient that appears very often, and it's usually just called "sauce" or so-su (ソース). What is this "sauce" anyway? This is the most popular brand of Japanese "sauce", although there are several other makers. It features a picture of a Bulldog. Some people call all "sauce" Bull-Dog sauce. ...and a lot more. Besides being used as, well, a sauce, it's also used to add flavor to stews and soups, in marinades, and a lot more. So what is this "sauce" anyway? While there are variations, called tonkatsu sauce (used on tonkatsu or breaded deep fried pork cutlets); chuunou sauce (pictured above) which just means 'medium-thick' sauce, usta- sauce, which is the Japanified version of Worcestershire (but usta- sauce is nothing like original Worcestershire sauce); okonomiyaki sauce, and so on. There's little difference between them though, except in the degree of sweetness, and a slight difference in fruitiness and viscosity. Most "sauces" list "vegetables, fruit and spices" as their ingredients, plus amino acids (umami), sweeteners, caramel coloring and other things depending on the type. "Sauce" apparently made its debut in the late 19th century in Japan, when it was sold as a different kind of soy sauce. This didn't work out well, since it tasted so different from well, real soy sauce. "Sauce" really only took off in the post-World War II era, along with the rapid growth in popularity of westernized or yohshoku (yoshoku) cooking, which had previously been limited to the big cities. While it's still associated with yoshoku, as its use on things like okonomiyaki and takoyaki shows it's now used as a flavoring ingredient for all kinds of cooking. 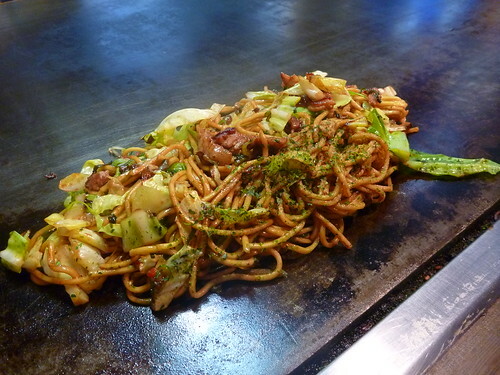 For example the Japanese version of stir fried noodles, yakisoba, is flavored with "sauce", unlike the Chinese version (lo mein) which is flavored with a soy sauce base. So do you need "sauce" in your Japanese cooking pantry? "Sauce" can be used for things other than Japanese food - on all kinds of meaty or deep fried dishes, in stir fries, and so on. As I mentioned above, I don't think there's a big enough difference between the "sauce" types to require stocking up on all of them, unless you want to of course or can spare the cash and space. 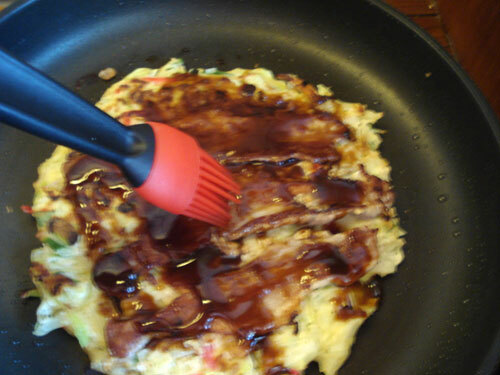 Okonomiyaki sauce is sweeter and thinner than chuuno sauce for example, but there's not a big difference. See below for ideas for doctoring any kind of "sauce". For what it's worth, right now I have one bottle of chuuno sauce in my fridge. If you don't have a Japanese/Asian grocery store near you, you can substitute other brown sauces. 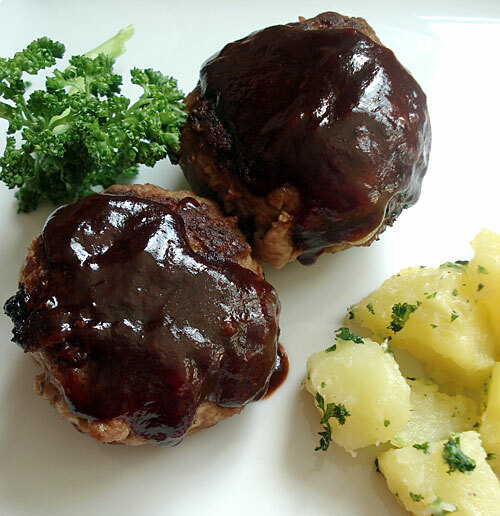 Traditional British Worcestershire sauce (such as the one from Lea and Perrins) is a great sauce and flavoring ingredient to have around anyway, but it's not really a good substitute for Japanese "sauce". Both are a lot tangier than Japanese "sauce" though, so you need to temper it a bit. Adding sugar works, but molasses or golden syrup may work better. You can try adding some grated apple (a sweet variety, not a sour cooking variety) too. For okonomiyaki, you may need to add sugar or other sweetener in a 1:2 ratio of sweetener to sauce to come close to commercial okonomiyaku sauce. Or, if you like your okonomiyaki with mayonnaise too, add a bit more mayo to neutralize the sauce's tanginess. Of course if you like tangy sauce anyway, you can just use one of those sauces straight. I have seen a few recipes suggesting oyster sauce as a "sauce" substitute, but to me the flavor profile is quite different, so I recommend one of those sauces mentioned above instead. Submitted by maki on 2013-10-07 16:40. Re: The Mystery of Japanese "Sauce"
Lea & Perrins makes a thick version of their Worchestershire sauce that's not quite as tangy as A-1 that may make another good option. This is useful to know. THanks! Thanks for the explanation. I live near many Japanese markets and am always amazed at the variety of "sauces" there and was wondering if I was missing out on anything. Hello, Makiko-san, I'm happy to see you blogging! ketchup, dashi, a bit of mustard, worcestershire sauce and a bit of soy sauce. Can it be accurate? I love your site, it's been a great inspiration and thanks for sharing the news about the english Cookpad site! I'm totally addicted! Is there a way to find out if the sauce is made with MSG? I have stopped choosing Tonkatsu because of the use in the sauce of MSG or a similar product I have an allergy to. Your blogs are where I turn to first and usually don't have to go further. Thanks for all you do for us English speakers! Unfortunately, just about all commercial tonkatsu sauce and similar "sauce" has MSG in it, unless you can get a 'natural, no additives' brand...which is pretty hard outside of Japan. If you are allergic you'd need to stay away from them I'm afraid (you may need to watch non-Japanese sauces too). I just use the regular Worcestershire sauce because in my area, the Japanese bull dogs cost about 15$ for a tiny freaking bottle. Swirl this "sauce" with Kewpie Mayonaise - very authentic sauce of Japanese childhood. Yum! Best to dress this dressing with shredded cabbage - a very common side salad in Japanese meals. Is there a difference between Unagi Sauce and Tonkatsu Sauce? While we were travelling across the globe Bulldog tonkatsu sauce was hard to get occasionally - a mix of 50% ketchup and 50% brown sauce/HP sauce did the job most of the time. It's not the same but it maintains the thickness and fruity flavour. Luckily my neighborhood (Nashville, Tn.) 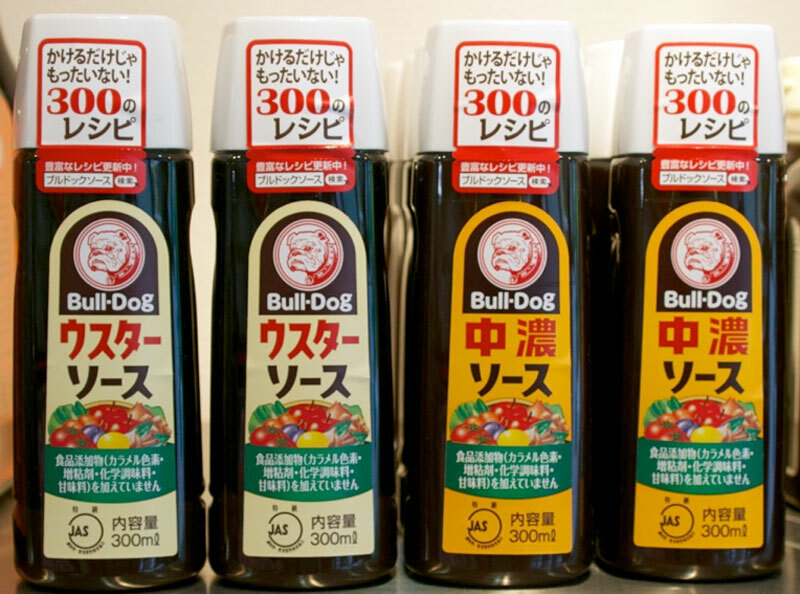 abounds with Asian Markets and Bulldog Sauce is easy to come by. I have given it to friends for Christmas a few times along with bags of panko and instructions on how to make tonkatsu. I have received many thanks for both the recipe and the sauce. Everyone loved it. I don't worry about MSG. I have a shaker of it on my table right now and use it like I do salt and pepper and have been doing this for over 50 years. It occurs naturally in so many things like, seaweed, tomatoes, celery, etc. The glutamate in MSG is chemically indistinguishable from glutamate present in food proteins. Our bodies ultimately metabolize both sources of glutamate in the same way. An average adult consumes approximately 13 grams of glutamate each day from the protein in food. Although many people identify themselves as sensitive to MSG, in studies with such individuals given MSG or a placebo, scientists have not been able to consistently trigger reactions. In most people the supposed allergy seems to be mostly psychosomatic. I found a recipe for tonkatsu/okonomiyaki in my favourite Japanese cookbook, The Japanese Kitchen by Hiroko Shimbo, and would gladly share it here, if you'd like. ^_^ It is so easy to make and of course you can play around and adjust it to your personal taste. As for Bull Dog sauce, I use it in all sorts of ways, from scrambled eggs to last night's successful experiment: tacos! mmmmm... it is great stuff! when i want a sauce like this, e.g. for okonimyaki, i usually just mix worcestershire sauce, ketchup and soy sauce. probably too simplistic and only a very rough approximation, but it's easy and easy to remember. Is Bulldog inexpensive to get in Japan? I'm a fan of Hiroko Shimbo's recipe for tonkatsu sauce; though I've taken to reducing the sugar by half, and using Lea and Perrin's thick Worcestershire sauce (now renamed "BOLD steak sauce"). If you don't have thick Worcestershire available, I would suggest adding corn starch to thicken. Can take a while to reduce to the right consistency otherwise, and your whole house will smell of it for much longer. Sauce is good, but I don't like my cake to be perfumed with it. HP is thicker than Worcestershire sauce, so perhaps it would be a better substitute texture-wise than Worcestershire sauce. Much to my surprise, yesterday I found Bull Dog at my local Raley's supermarket in Nevada! Raley's carries a good selection of "ethnic" foods, including Asian condiments, etc. Though I didn't expect to, I was delighted to find it! As you said, the taste is unique, perhaps reminiscent of other sauces and flavorings, but quite distinct. Very tasty. Thank you for including a photo; otherwise I would have missed it -- right in front of my eyes on the shelf!!! Actually, I've wondered about "sauce" for a while. We have a thriving Asian population around Chicago, so it shouldn't be hard to find (Mitsuwa's Japanese grocery isn't far away from me), but I like knowing the approximations too. I'm not very experimental with making food, so your descriptions of what the taste is like will be very helpful in trying to attain similar flavors when I do cook. Your blog is really helpful, thanks! I'll see if I can find it in my asian grocery, I think I never saw it but hey, it's worth to check. I hope you are feeling better, take care and rest a lot! This stuff is great! I picked some up the other day to try to make okonomiyaki (did a so-so job on it). It is tasty stuff! I think I like it better than Worcestershire. It's sweeter, without being too sweet. Just for kicks I put some on my scrambled eggs this morning. Nice touch! This might become a new favorite. 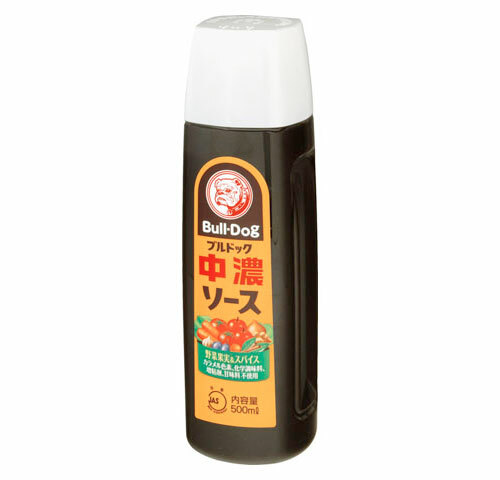 I have some Bull Dog Tonkatsu Sauce. I bought it to serve with okonomiyaki and I like it. But I once made a similar sauce with equal parts of ketchup, agave syrup and vegan Worcestershire sauce and it was good too. Ahhhh - the classic Japanese brown sauce. When I left Japan one of my work work mates gave me a bottle as a going away present... rather amusing at the time. Please explain about black sesame paste, and how to make fillings for buns, mooncakes and other sweets out of it. I love your site, you explain everything so well. I would like to know how to make a decent copy of the Japanese sauce. I experimented with some ingredients and the result was ok but not universally acclaimed by my home taster. You can make a tolerable Bulldog sauce by mixing up Worcestershire, tomato sauce (catsup) a dash of vinegar and a big smear of American style mustard. When our son was still a toddler, sitting at eye-level with the sauces and condiments on our table, he innocently asked for some "inu no shoyu", which translates out to "Doggie Soy Sauce" and that's what we've called it ever since. Another great Japanese "sauce" is Japanese Spicy Mayo. It's a great accompaniment for sushi and fantastic addition to burgers and other sandwiches. Give it a try! hello could you please give me the recipe for making tolerable Bulldog sauce , am in vietnam so hard to fine thise kind of sauce , am not really a cook but my job right is a cafeteria cook i do my best to cook could you please help me on that recipe . thank you very much in advance..